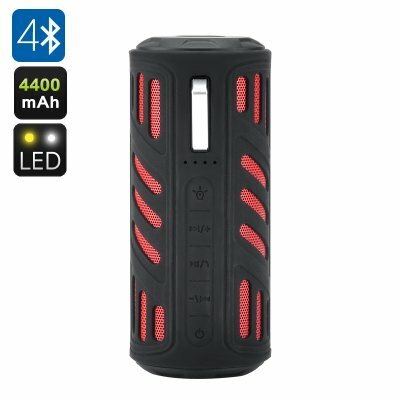 Successfully Added Portable Rugged Bluetooth Speaker - Bluetooth 4.0 + EDR, 4000mAh battery, Power Bank Function, Flashlight, Watherproof to your Shopping Cart. This portable Bluetooth speaker is compact enough to carry in your jacket pocket and comes with a helpful hook and carabineer letting you clip it to your pack or waist belt. With its rugged rubberized outer and weather proof design its no stranger to the outdoors and perfect for trekking, camping trips or picnics. With two 5 Watt speakers you get a great stereo quality sound that’s surprisingly loud and covers a nice area so you can bring the life to any garden party or BBQ. With a high capacity 4400mAh battery you can enjoy plenty of play time and the Bluetooth 4.0 connectivity makes playing music easy from your Smartphone or tablet, alternatively use the 3.5mm audio jack to connect to your music player. With hand free call answering this 10 watt Bluetooth speaker won’t let you miss any calls and allows them to be answered direct from the speaker at the touch of a button. With its large 4400mAh battery the speaker can also double as a power bank ensuring you wont run down your phone while playing music. With a built in flashlight and it shockproof, dustproof and weather proof rating this speaker makes a great accessories for any outdoor trip and let you take the music with you wherever you go. This 10 Watt Bluetooth Speaker and Power Bank comes with a 12 months warranty, brought to you by the leader in electronic devices as well as wholesale Bluetooth speakers..